At the heart and soul of the house music scene in Soweto, a small group of female DJs are making a name and claiming the beat all for themselves. It’s just after sunset on a lazy Sunday evening, when Palesa Sebolao walks into a vast venue. She has a black backpack on her back, wearing a pink hoodie, pig tails, and pink Converse All Stars. She approaches the table where her friends are and takes a seat. In two hours from now she will transform into the star of the show. She will become DJ Palee. In the same way, the venue itself undergoes a transformation. 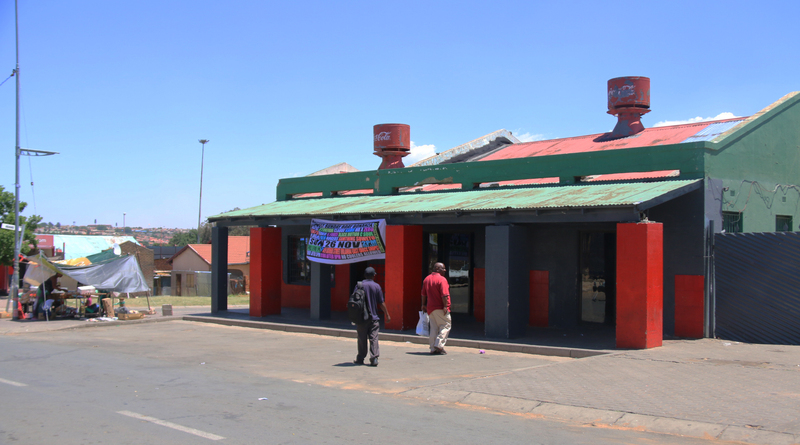 On Rathebe Street in Orlando East, Shop to Shop, is a hair salon for six days of the week. But every Sunday the shop takes on a different character and is known by a different name – Sweet Sunday. At around noon, Shop to Shop slowly gets changed into an outdoor lounge area enclosed by tents – there are soft benches and long tables, to the front there is a disk jockey (DJ) booth and two speakers on each side. She attentively makes her way to the DJ booth, making various stops at tables to greet some of the regulars. People at the venue can still make their way around easily as it is not packed. She takes off her backpack and reaches inside for her CDs. On the other side of the booth, the audience is indulging in conversations and drinks. Five minutes later everyone is on their feet grooving to the tunes, courtesy of DJ Palee. Her mix starts off at a very quick tempo, which encourages everyone to get onto their feet. After attending a three-month course at Fuse Academy DJ Palee went straight to the DJ booth and elevated her craft to a point where she could play in front of a crowd. Fuse Academy is an only female dj-ing school based in Melville, and is partly owned by DJ Zinhle. Some of South Africa’s best known female DJs like Miss Pru and Ms Cosmo have studied there. “O, kganti wa dlala?” meaning, “Oh, so you play?” remarks an audience member in amazement after realising Sebolao was indeed DJ Palee. She has always loved music, regardless of the genre, and this is one of the reasons she is now a DJ. She plays some of Soweto’s most sought-after genres, like house and kwaito. ON THE DECKS: Palesa Sebolao playing at her first gig of the night at Sweet Sunday in Orlando East. On a Sunday the streets of Orlando East are buzzing with the echo of the sultry and alluring sounds of somewhat of a rhythmic piano recital. A song you do not know is playing and you can’t help but move fiercely with the bass of the drum that hits your heartstrings. The majestic melodies sound mysterious and all so familiar. The amapiano mix by DJ Palee has the crowd swaying and twisting to the dial of the piano. Someone in the crowd does the vosho which is a dipping motion with a slight flick of the leg. Someone else is doing the gwara-gwara which is usually done when a faster song is played. However, this gwara-gwara accompanies every beat of the song, attentively flicking the right elbow and left leg alongside the beat. Being an advocate for female DJs, she says, “I think female DJs rock for the mere fact that the very same things we are underestimated in, we master so well.” She continues to prove the audience wrong at every gig or event she plays at. There are many female DJs in Soweto but not enough of them are getting booked as resident DJs at clubs. One out of three female DJs are resident DJs in Soweto, says Nobuhle Nhlapo (DJ Buhle) who has been a resident deejay at Sefateng. Nhlapo has been in the industry for over 10 years. “The same week I started DJ-ing I got a job,” Nhlapo says. It was only in 2014 that DJ-ing became lucrative enough for her to leave her job. Having started in 2014, DJ Palee is rather young in the industry, but is proving to be one of the favourites at Sweet Sunday. She mentions how tough it is to navigate in this male-dominated industry. A recurring trend in the industry is the idea of marketing yourself, making sure you are a brand within your field. “If ba sa ho tsibi a neva ba ho book(er),” she says, meaning that music promoters do not book DJs that aren’t known. Therefore, being visible is very important as a DJ so that you can get booked. Besides being visible within the community, DJ Palee also takes time to brand herself online. When I searched for DJ Palee on social media, she had over 1, 000 followers on Facebook, and she had a Soundcloud page on which she promoted her upcoming singles. She uses certain mixes and promo tracks to create hype around her brand. DJ Palee has a promo track titled Females Rock, which she uses to bring more following onto her social media pages. DJ Palee says, “I called it Females Rock mainly because the world has the perception that females can’t be music producers. The promo track was used to show that even we can do music production.” Besides playing at events, DJ Palee also produces music and is working on a single she would like to release soon. Music and dance is an integral part of the community in Soweto, in particular house music. You can hear this type of music at spaza shops, school transports and homes. The house music phenomenon extends to the greater part of the country. 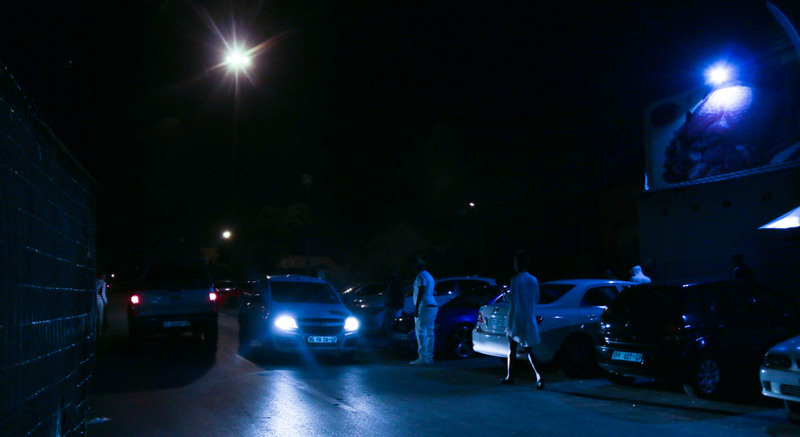 According to Thump online, “South Africa is the biggest purchaser of deep house music per capita in the world.” Which is the case in the vibrant township of Soweto, where house music is played in clubs, bashes, chesa nyamas and parties. Even though house music has its roots in the streets of Chicago, the sound changed as it emerged in the dusty roads of Soweto and it incorporated sub-genres that are solely South African. House music has sub-genres that are loved across bashes and parties in the township. The DJs are booked according to the sub-genre they play. There is a certain mood that is maintained throughout the whole event, starting off with a soulful pace which creates a rather relaxing environment and is also reminiscent of the jazz Sundays that used to be held in Soweto. Music in Soweto has history that can be traced to the marabi jazz nights during the early half of the 20th century, and further traced to kwaito which was big in the 1990s among the youth. Lesedi Tsilekae strongly maintains the opinion that male DJs are better than female DJs. She has only seen two female DJs play and it was not in Orlando East. Tsilekae is a house music fan who says that the house music scene is growing in her township. Later into the night the pace of the music goes through a transition which sees the tempo quicken. Lebogang Seoka, a DJ based in Orlando East, said the later it is in the night, the faster the music becomes. This is done to accommodate the heightened mood of the audience. Seoka referred to the sub-genres as deep tech, soulful house, soulful vocals, amapiano and commercial house music. Seoka also mentioned that he is a lover of music before he is a DJ, and that he has been in the industry since he was 13, but only knows one female DJ from Orlando East. “You literally have 15 minutes to show everyone what you got.” The crowd seems like it is hard to please, however, DJ Palee makes no hesitation and fires up her set, with her left hand on the CDJ and her right hand on the mixer – the party begins. Taking the crowd by surprise, she consistently heightens the mood of the party with the audience’s favourite type of tunes. The crowd did not necessarily gravitate to her when she arrived but as soon as she starts playing her set she reigns as the Amapiano Queen of Orlando East. Research is one of the most important aspects when it comes to playing at a gig or event. DJ Palee said the DJ needs to first check the venue and establish what the vibe is before preparing a set. She always tries to get to an event an hour or two earlier so she does not make the mistake of repeating a song that was played in a previous set. Just like many other DJs, DJ Palee sees it as a “hustle” and is also studying and working at the same time. She said she would take up DJ-ing as a full time gig if the opportunity presented itself. House music fan Sihle Hlatshwayo attests to the fact that the genre is big in Soweto. Hlatshwayo has been to a number of bashes and clubs in the township and the majority of the music played is house. From the audience perspective there seems to be a reasonable amount of female DJs on the decks. “The response is based on the selection and mixing. People enjoy good music played at the right time,” says Hlatshwayo, who explains how massive the house music scene is in Soweto. He compares it to that of Pretoria which is known to only have one type of house music. NOT SO SWEET: During the week, Shop to Shop is a hair salon. HAPPY HOUR: Rathebe Street in Orlando East on a Sunday night. One of the emerging sub-genres in house music is amapiano. Music producer Lehlohonolo Mathibe describes it as a “dialled down tempo and use of minimal vocals, but rather rhythmically rich wood lock percussion”. Sebolao’s set at Sweet Sunday consisted of a lot of music from this sub-genre which was loved by the audience. She prides herself on her versatility, as she plays a variety of house music. The mood at the gig is the determining factor on which type of house music will be played. Being in a male-dominated industry has never killed DJ Palee’s spirit as she identifies as a DJ and not a female DJ. However, that does not change the fact that more male DJs are booked at events. DJ Palee was the only female DJ to play at Sweet Sunday between 6pm and 11pm. She mentioned how difficult negotiating with promoters can be as a woman. “O tla thola ba ho patala ka le botlolo” (Promoters may offer to pay you with a bottle of alcohol”), if you are not assertive. There are many claims that have been made to explain why not as many women are as successful as the men in this particular industry. Nhlapo explained that safety is imperative as a female DJ – in particular when it comes to returning home after a gig. She also mentioned how that could be a factor when being considered as a resident DJ. One of the founders of Sweet Sunday, Thabang “Maestro” Mphahlele, is surrounded by his jubilant friends throughout the night, with music accompanying the sultry conversations about business and success. Maestro is in charge of the line-up and makes sure he checks up on the DJs now and again. Meticulously making his way through the crowd and nodding in affirmation at everyone that notices him, he walks to and from the DJ booth, approving at every mix produced by the DJ. He said Sweet Sunday is a platform for up-and-coming artists and DJs. He gives the artists of Soweto an opportunity to show their talents and still remunerates them. 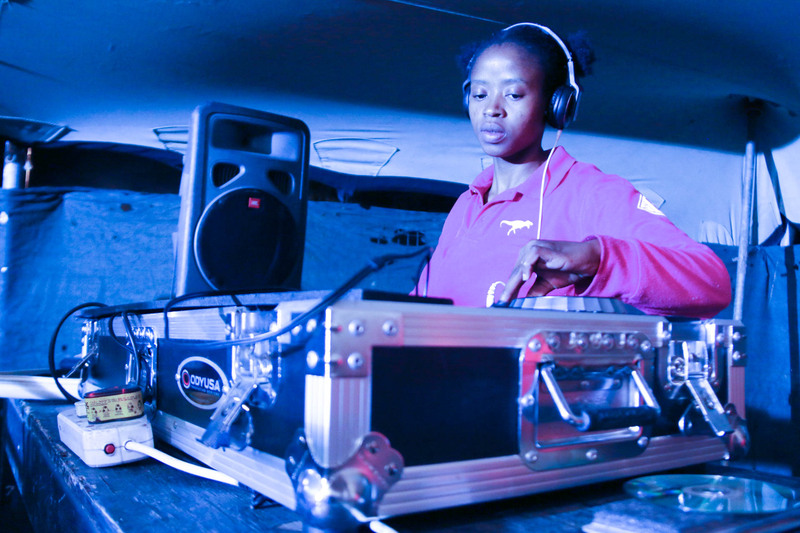 Female DJs in Soweto are continuously growing across genres, in particular house music. It’s 10pm and DJ Palee has just played the last song from her one-hour long set. Some are still on their feet while others are walking back to their designated tables. The last song in her mix still has the piano dial, however, it is slower than the dial at the beginning of her set. Affectionately making way for the next DJ, she packs her CDs back into her backpack, exchanges a handshake and walks back to the table where DJ Palee becomes Palesa Sebolao again.